Wonderful and rare ribbons and bows with flower brooch. 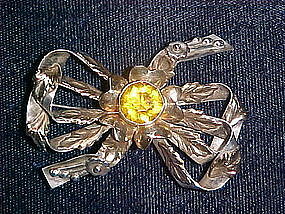 This pin is made of sterling silver wrap with 14k gold ribbon and has a center flower with a set yellow topaz colored stone. It is signed, " HOBE Sterling 14k." It measures about 2 3/8" wide and 1 1/2" high. 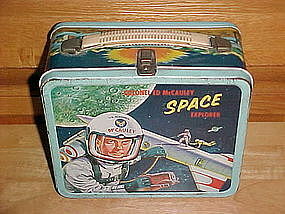 It is in wonderful condition and is circa 1940's. 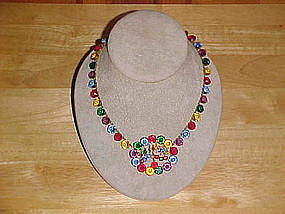 Extremely rare WEISS matching necklace and bracelet. 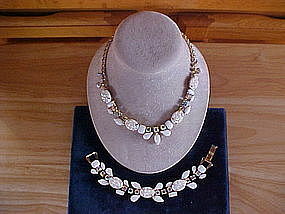 This vintage WEISS set features carved satin stones, milk glass and aurora borealis rhinestones, all pronged. 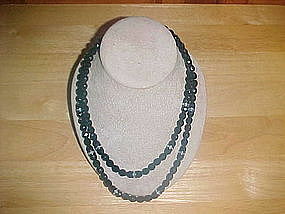 The necklace measures 16" long and the bracelet is 7" long. 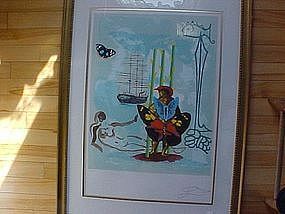 Both pieces are signed with a "WEISS" signature plaque. 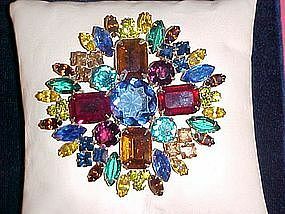 This seldom seen set is in fine condition and absolutely stunning!!! 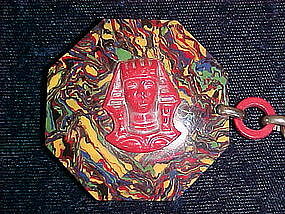 Rare vintage perfume atomizer. 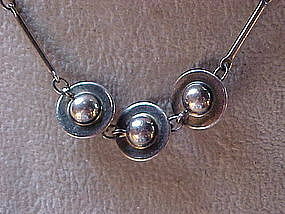 The cap is Sterling Silver and is signed " GEORG JENSEN, U.S.A., STERLING." The cap top has the famous Jensen Pine cone design. 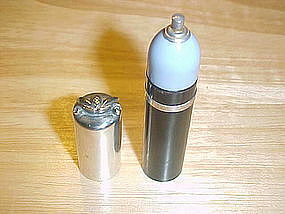 This atomizer is 3 1/8" long and is in fine condition. A MUST FOR THE JENSEN COLLECTOR!!! 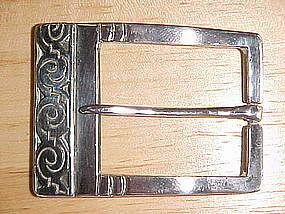 Fabulous vintage Mexican Silver hand crafted Belt Buckle. 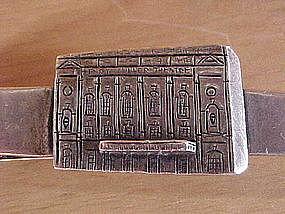 This belt buckle was made at the famous Taxco silver shop of Victoria and is signed " VICTORIA TAXCO STERLING, MADE IN MEXICO, 142." This wonderful work of art is in fine condition and weights about 1 troy oz.. It measures 2" long x 1 1/2" high. 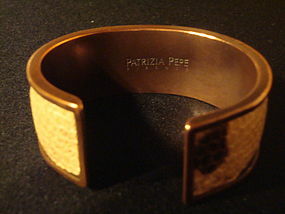 This buckle can be worn by either a Gentleman or a Lady. 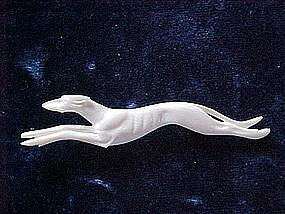 Wonderful vintage 1920's - 30's carved Ivory brooch featuring a racing Grey Hound. 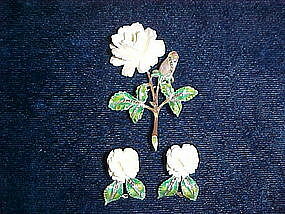 This Ivory pin is just fabulous, finely carved details!!! The Grey Hound measures 3 7/16" long and 1/2" high and is in MINT CONDITION! Note: This pin is made from genuine Elephant Ivory and can only be sold within the United States. 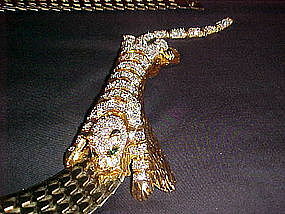 Super example of the early works of master jeweler SANDOR. 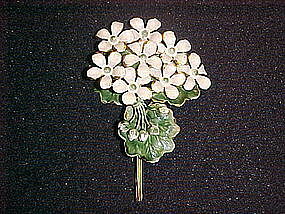 This rare pin features stems of clustered flowers with leaves, all in enamel work. This pin is over 3" long and 2" wide. There are some minor enamel flaws due to usage over many years but still a lovely pin in very good condition. A must Have!!! 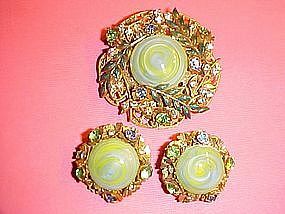 Beautiful 1930's 3 piece set including a brooch and a pair of clip earrings. Each with a genuine Elephant Ivory carved Rose. They are made of Enamel covered Sterling Silver and have set marcasites. This set is in fine condition and each piece is marked " STERLING GERMANY." The pin measures 2 2/8" long and each earrings measures 1" long. NOTE: This set contains genuine Ivory and due to Customs law this set can only be sold to customers in the United States.